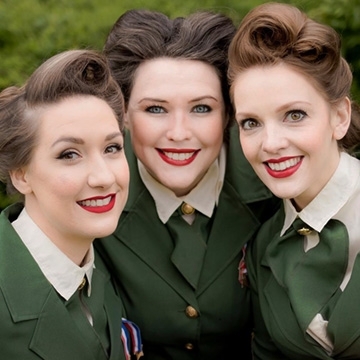 The Swingtime Starlets are an all-professional close harmony trio, who perform songs from the 40’s Wartime Era, Hollywood’s Golden Age and Retro Pop! Get your toes tapping, your sweetheart swaying, your jitterbug jiving and become entranced in the romance as this diverse, dynamic duo transport you through the eras of Swing, Jazz and Blues. Let their renditions of the Great American Songbook and Hollywood’s Golden Era transport you through the years with their beguiling voices, close harmonies & vintage style!